Love is a graduate of the Royal University of Phnom Penh (RUPP), where she majored in tourism management. At age 15, Love left home to live at the Cambodian’s Women’s Crisis Center where she won a scholarship to study at Kamplong Kdie High School and graduated with high scores on the Cambodian National Exam. After she graduated from high school, she won a scholarship to attend RUPP. In 2015, Love was selected to study in an exchange program in Mahidol University in Thailand, where she received intensive training on ASEAN Mainland Inter-relations affairs and strengthening Cambodia-Thai diplomacy. 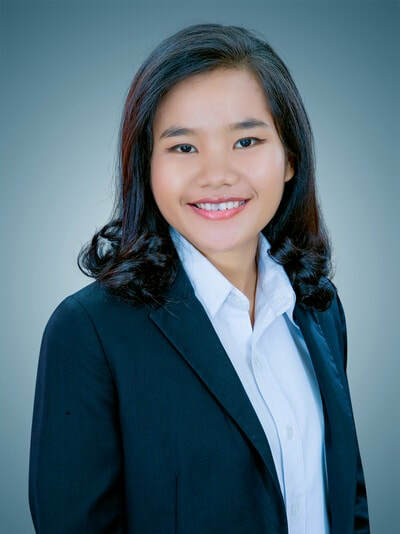 She participated in the Young Leader Program at Transparency International Cambodia, where she led projects on corruption reduction and enhancing transparency in Cambodia. Love also joined the Cambodia Young Women’s Empowerment Network to volunteer as a social media specialist and event organizer. In 2017, she actively volunteered as an English teacher at Africa-Asia Development Relief Foundation Cambodia serving underprivileged children living on the outskirts of Phnom Penh by teaching them about hygiene. She was also part of an environmental project sponsored by Winrock International and USAID Cambodia, which is devoted to researching wildlife in Northern Cambodia and proposing creative solutions for sustainable development. For two years, Love was a member of the U.S. Ambassador’s Youth Council, working on topics of interest and youth engagement, particularly on environment, education and female empowerment, in order to generate feedback on U.S. policy and programs in Cambodia. She was also selected to be a part of Wedu, an international mentoring program for up-and-coming Asian women leaders. Love is currently a sophomore at the University of Minnesota where she studies journalism.